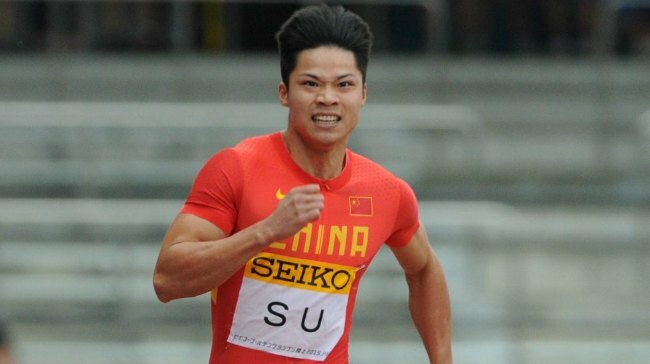 Su Bingtian made history this year by becoming the first man in China to break the elusive 10 seconds barrier for 100 meters not once, but twice. He ran 9.99 in Eugene, followed by another 9.99 (-0.4) at the 2015 Beijing World Championships semi-finals which qualified him for the finals. After reaching the 100m final at the World Championships, Su also helped China to a silver medal in the relay. Note the progression of Su Bingtian. He ran 10.06 in 2013 and 10.10 in 2014. By switching his starting blocks feet, and reducing stride length, Su Bingtian broke 10 seconds. Starting Blocks – Should You Switch Your Feet? I feel your instinct in the starting blocks is crucial. For a Masters’ athlete, running 11.90 vs 11.95 may not be a big deal. But running 9.95 vs 10.00 and making the Finals at the World Championships or Olympics IS a big deal. Qatar’s Femi Ogunode ran 10.00 in the semi-finals, and watched the Finals in the spectator stands. The best way to test for your rear foot placement is having someone push or shove you from behind by surprise, and see which leg instinctively moves first and forward. My right foot moves forward, to prevent falling flat on my face, thus my right foot is the rear foot.